These were my thoughts after I had hastily carried Iced Earth’s latest album to my flat and inserted it into the stereo system while opening the booklet. Definitely the most anticipated release of 2007 for me, I had refused myself of listening to any form of this album before the actual release, be it official promo or otherwise. The Overture Of The Wicked EP was the only thing I allowed my ears to touch. So here lies the beginning of the full epic story of Set Abominae, Jon Schaffer’s science fiction-meets-history of civilisation-meets-indirect theological commentary –magnum opus. Framing Armageddon is the first part with the second instalment slated for a release in spring 2008. Many words have come to my mind after repeated listens of this album. Epic, atmospheric, theme-driven, a true concept album. As my expectations were astronomical for the band, this album underwhelmed me on the first listen. Those seeking mostly for the thrashing, fast triplet-riffing power drill-side of Iced Earth is will be left confused at first. Surely, there are steamrolling fast parts and pounding riffage a-plenty, but not as much as I, for example, would have expected. This album is at its definite best while studiously reading the inner sleeve along with the songs, looking the excellent illustrations that depict the storyline and really putting ones imagination into the situation of the characters. The tale of the ancient Setian race, their near-extinction in the hands of man and their coming revenge in the form the wicked one, is really something that at least someone as nerdy as me can totally get engulfed in. Despite the warning, Jon’s wrist seems to be in fine form as the riffs still scorch with power and the hooks are flying at an ever increasing pace after each listening. Returning drummer Brent Smedley displays some wicked chops, especially on the bass drums. The guy has not lost a thing since the Alive In Athens-days, and his beats and fills kept surprising me almost at every turn. Tim Owens has also become an ever more confident vocalist behind the demanding post of giving Schaffer’s grand tales a prominent voice. He actually doesn’t wail as much as one could have expected (or feared) but displays a lot of range, emotionally as well. Because I’m sure no one had doubts that the guy could cut it technically. Ripper is a beast when it comes to the classic metal voice. But on this record I feel he has really grown on the emotional side, displayed mightily in the more thoughtful tracks like Reflections or A Charge To Keep. He has often been accused of merely executing instead of really interpreting and living the lyrics, so to speak. On Framing Armageddon, I’m not only soiling myself over the banshee-wails. I am also impressed with his versatility. 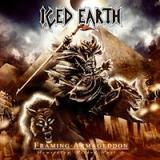 The song material has probably the broadest range of moods in Iced Earth’s career. The pre-released Ten Thousand Strong has really grown on me as the most pummelling track on the album and that chorus is still pure gold. The other mentionably up-tempo tracks like Setian Massacre and the title track are equally fist raising. Especially the latter shifts the gear ever higher in the three and a half minutes of annihilation it contains. By the end with Rippers bloody murder-screams soaring on top of the molten banging, my hair is splattered all over the walls. The main focus here however, seems to be on the atmospheric-in-a-very-heavy-way mid-tempo tunes and the occasional mellow tunes. A Charge To Keep brings me big vibes of the previous Glorious Burden-album with the big choirs and massive emotion. Choirs are implemented in big ways on several tracks here, most notably on When Stars Collide (Born Is He), which brilliantly conveys a sense of impending doom, something massive approaching. I may be even pressed to say that The Clouding, the longest song on the album, is my favourite here. It starts off as a ballad with slide guitars of all things, and builds onwards into a “chuggernaut” very much reminiscent of the longer tracks from Black Sabbath’s Dio-era. As you can guess from a concept-album, there are many shorter “interlude”-tracks here like Invasion and Execution, that will likely bore those trying to enjoy single songs here and there, but should be very gratifying to those going along with the whole story. I’d say the only “complete” track on the record that I can’t get into is Infiltrate and Assimilate, despite it having a very infectious drum pattern. I must add separately, that one of the most enjoyable elements on display on the album is the organ, which is most prominent on The Domino Decree. The song gets very Deep Purpleish when the Hammond begins to widdle and I’m loving it. I think you already get my drift of the theme’s importance for this album. Although almost all of the songs work as individual pieces, the experience is infinitely better when taken in as an entire surge of music combined with storytelling. I’d say this is definitely IE’s most demanding album so far. It took me considerably more time to sink in when compared to any of their earlier masterpieces. There is a lot to chew on, but given the time, it should really give a lot in return to fans of heavy music of any kind. This is definitely a labour of love for Jon Schaffer, one that he has spent years conjuring up, and I fell it shows in listening to the many layers in the work. After listening to this album many times, one more major thought hit me. Framing Armageddon is a rare album in the sense that it actually gets better in the end. You could feel like me, that with most albums, the “hits” and best tunes are put into the “first half” of an album, if we speak with vinyl-format lengths. This album improves as the minutes draw closer to the end. This makes prefect sense, when you think about it story-wise. If you follow the tale along with the music, you get to know more with each song and each verse and note pulls you into the story more deeply. This also leaves the feeling that the albums title can be taken very literally. At least I get a very strong feeling after delving into Something Wicked Part 1, that this album indeed is merely “framing” the world-crushing events coming with part two within six months. Call it cooky fan-boy hyping, call it overtly interpreting a grandiose, yet a lil' silly sci-fi novella, but that is how I feel after completing this album. We are merely being introduced to the coming curse, for Armageddon…is coming soon.